Many people—particularly those who were children back in the 1980s—like to chart the flow of technology by one central metric: “Back to the Future 2.” Showing us the future of Hill Valley, California fully 30 years ahead to 2015, we saw things of staggering potential; restaurant wait staff replaced by robots, entire gardens that could be raised and lowered from a central point in a kitchen ceiling, and of course, the holy grail of future tech, the hoverboard. 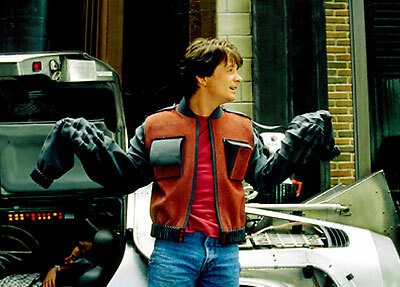 But one piece of Hill Valley's future may be closer to realization than before: a piece of wearable tech called the automated jacket. More specifically, Purdue researchers are, at last report, working on a new kind of robotic fabric that can essentially move and impact objects besides itself. For instance, researchers covered a block of foam with the robotic fabric, and not only had the means to compress the foam block, but also the ability to bend that foam block. From there are several distinct possibilities, including robots that can move like worms or snakes, using pressure and friction to inch along, as well as a variety of clothing options. Originally, the fabric was designed as a means to create robots that were durable enough to be sent into space missions; a robot that's essentially cloth and foam is going to be able to survive quite a bit of impact, though it will have an unusually pronounced weakness against fire. This is set to be used in conjunction with another discovery from Switzerland's Ecole Polytechnique Federale de Lausanne, involving a kind of fabric that can alternate its stiffness thanks to the introduction of shape-changing polymer strands comprising the fabric in question. Robots designed with such fabric could be done “on the fly”, according to assistant professor of mechanical engineering at Purdue Rebecca Kramer, owing to the comparative simplicity of such designs. Uses for something like this of course go to the “Back to the Future” frame easily enough, but consider from there. What if there was a jacket that could compress itself down to thin for warmer weather, but expand itself outward to take advantage of dead air insulation for colder weather? That would only go so far, of course, but for a cooler-weather jacket, it might make all the difference. Plus, when wearers enter a building, the jacket could retract in deference to the heat inside the building, expanding outward when the wearer leaves. Naturally, that's just a starting point; there are already ideas for other things like compression suits to take on high G-forces as well as the aforementioned robots, but this is a product with quite some potential. Using the fabric as a kind of customizable insulation for houses, that expands and contracts as need be based on the weather, or as part of robotics operations not just in space but also in tight spaces like caves or collapsed buildings as rescue operations assistants can also be a possibility here. While we may never see hoverboards and Pizza Hut pizzas that can fit in the palm of a hand until rehydrated later, some of the innovations we've seen in “Back to the Future 2” may be closer at hand than previously thought. The robot waiters come quickly to mind. Regardless, though, the Purdue fabric is clearly laden with possibility, and might ultimately be the start of something very exciting in the long term.